Last month, I went to an amazing training called the Skid Row School for Social Change. The mission of the Skid Row School is to train leaders to scale solutions to the world’s biggest problems as rapidly as possible. It's run by Becky Mangiotta and Joe McCannon, two brilliant nerds who led national movements in homelessness and public health and then decided to teach others how to do it. I attended because I'm seeking new ways to share the MAH's model and support the development of more community-centered cultural institutions around the world. I learned a ton at Skid Row School, but the lesson that still keeps me up at night is this one: when you want to scale and spread a model, you have to distill it to its essence. Unless you're going to franchise, you can't maintain control of 100% of how your model spreads. Nor should you want to. The power is in unleashing the model, ceding control to others who will adopt it and take it further than you ever could. But if you're going to unleash something, you better make sure that you believe in it 100%. Some people are rightfully fearful of "dumbing down" their model for scale. As Becky and Joe noted, it can sound like taking your amazing craft beer and distilling it into a Bud Light. But they suggested another metaphor: the turkey sandwich. Imagine that your existing project is a turkey sandwich. You've spent years making it the perfect, artisanal turkey sandwich. You've got just the right mustard, two slices of lettuce, pickled onions... it is dialed-in delicious. But if you want to share and spread that turkey sandwich, you've got to focus on the basics. To make a turkey sandwich, you only need two things: the turkey and the bread. When you want to scale, you need to get clear on what is the turkey and what is the bread. If you insist on all those artisanal fixings, you severely limit the clarity and scalability of your model. That's not to say the mustard isn't important. The mustard matters! But it's not the heart of what you are trying to share. And if you get it right, others who adopt your model should be able to pick their own mustard, or leave it out entirely, to the tastes and needs of their community. What is the turkey and what is the bread of the MAH? I've asked myself this a thousand times in the past month. Is it partnerships and participation? 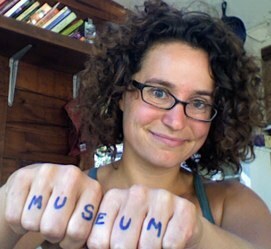 Treating the museum as a community platform? Igniting events and activities? Social bridging? Our participants reflecting local age/income/ethnic diversity? I've also started tinkering with an alternate food-related metaphor for this quandary: sourdough. When you make a loaf of sourdough bread, you begin with a "starter." The starter is a living culture of bacteria, yeast, flour, and water. Each time you bake a loaf, you use a little bit of the starter to get it going. In-between loaves, you feed the starter flour and water to keep it growing and healthy. The starter is alive and infinitely expandable. You can share it, split it, grow it, or let it die. As I think about how the MAH might share our model, I find myself gravitating to the sourdough starter metaphor instead of the turkey and the bread. Like the turkey and the bread, the starter is the epicenter, the beginning, the core. It has a unique flavor profile, but when you bake it you can add other ingredients to your preferences. It can be shared, used, and expanded. But starter is more than just core ingredients. It is alive and mutable. It's a catalyst for expansion, but it needs love and attention to keep growing. Do you have any ideas for me on the identity of the "starter" from which the MAH's work grows? If we shared a slice of the MAH's starter with you, what would you hope it might cook up in your world? I first read about Story House Belvédère on Jasper Visser’s excellent blog, The Museum of the Future. This small, startup cultural project in Rotterdam works directly and intimately with community members to share their stories. It is a platform for social bridging and cultural exchange. Jasper enhanced his original post to share with you here. I hope you’ll be as charmed and inspired by Story House Belvédère as I am. Story House Belvédère in Rotterdam, the Netherlands, is a magical place. On a beautiful location in a former jazz-era night club, a committed team works on storytelling activities to bring different communities in the city together, and contribute to a happier, more engaged city. They do so by making the stories of individuals and communities visible, and encouraging new encounters. In its short existence (it opened in 2013), the place has made a name for itself as a successful community-driven, innovative cultural initiative. I visited Story House Belvédère as part of the new Intangible Cultural Heritage and Museum Projects I am involved in. I had heard a lot about Belvédère before my visit, so my expectations were high. The place surpassed them. I spoke with some of the people working there, especially founder Linda Malherbe. What makes Story House Belvédère so special? It is rooted in its diverse neighborhood and the people who live there. Story House Belvédère is in Katendrecht, in southern Rotterdam. Katendrecht is a part of town that for over 125 years has been a home for migrants and newcomers to the city. The neighborhood is a mix of people and communities by design and has a rich social history. Currently, the neighborhood is being gentrified and its development, which tells a wider story about the city, is ongoing. The team found the current home of Belvédère almost by chance when they were looking for a temporary working space. But the location proved perfect. According to Linda, the project could not have been imagined and developed anywhere else in the city. A diversity of people and stories is the reason it exists. It started as a community project rooted in relationship-building. Before there was a house, the team behind Belvédère organised a community-focused social photography exhibition outdoors on one of the quais in the south of Rotterdam. It was an exhibition of group portraits of the many communities in the area. City officials doubted the idea of an exhibition in the public space in a part of town they considered dangerous. They said, "you will get shot at, and in two weeks everything will be destroyed." But they were wrong. The exhibition was up for a year and a half. When it ended, the portrayed communities took their portraits home, starting relationships with Belvédère which in some cases still persist. The success of the storytelling events encouraged the team to look for a permanent location. They found it in the old jazz club/boxing gym/neighborhood museum Belvédère, a building which dates back to 1894. Together with the communities they had worked with before, they are now renovating the building. In 2018 it will officially reopen. But currently you can visit when the door is unlocked - which is almost daily. After the formal reopening, they still expect to evolve. As Linda says, the process will never be finished, as people will always continue to add and make changes to the building to reflect new stories and ideas. The community values of the team permeate the space and their projects. Already you can feel Story House Belvédère is a special place. You feel it the moment you step into their warm and welcoming space. It feels like a living room, where everybody can be a friend. Even the coffee cups and the cookies are in style. The magic, of course, goes beyond aesthetics and is deeply embedded in the organization. The approach the team takes to connect with communities and then connecting communities is straightforward. In projects, they build a profound relationship with one specific community, such as the Chinese, Bulgarians, or football hooligans. This relationship is based on a genuine interest and includes a long-term commitment to stay involved with each other. When I visited, a community member had made our delicious Bulgarian lunch. Such profound ties make it possible that when a new project focuses on another community, the team can personally invite people from other communities to join. In that way, they build bridges between communities. Everything starts with listening and being curious about the other, and then inviting people, as guests, to take part. This approach permeates all activities of Story House Belvédère. If you rent the place for a private event such as a wedding, some spots at the event are reserved for people from other communities. So, if you’re interested in joining a Syrian wedding or Jewish Bar Mitzvah, you can. The reason this works is because of the personal ties between the team and the communities. The aim of Linda and her team is to create relationships with people that are everlasting.